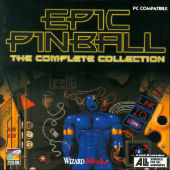 Epic Pinball is a 1993 pinball video game developed by James Schmalz and published by Epic MegaGames (now Epic Games). The initial release pre-dated Schmalz' Digital Extremes name. The game is played seen from a 2D top-down view within a scrollable window with plain raster graphics in 320x240. The music is composed in the PSM-format. It was noted for being programmed entirely in assembly language. It is written for the x86 computer family for MS-DOS. The game was originally distributed on floppy disks in 3 separate packs of 4 tables each: Pack 1 (Android, Pot of Gold, Excalibur, Crash and Burn), Pack 2 (Magic, Jungle Pinball, Deep Sea, Enigma), Pack 3 (Cyborgirl, Pangaea, Space Journey, Toy Factory). The original shareware version (and an early retail version) included only the original "Android" table. Later shareware versions and retail versions contained an updated version called "Super Android" (although it's still referred to as "Android" in the game, the table was changed to say "Super Android") Another table, "African Safari", was included in the "Full Edition" (the CD-ROM version), in addition to the tables from the three packs.